Having very kindly been sent a copy through the publishers and Goodreads to review I enlisted the help of my grandson aged 10 to get a balanced account of this 3rd part of the Hobbes End trilogy. I found the book most entertaining although not having read the first two books I did have to reread sections to fix in my head who the main characters were and what had happened previously to understand where the storyline was taking us.This all action angels and demons story moves at a fast pace and is full of the most delightful descriptive writing, setting each scene and actions clearly in one's mind. Lots of humour pops out at unexpected moments and the characters come to life on each page. I thoroughly enjoyed this journey and just cannot believe how young people's books have changed over the years.When it came to my grandson, a chapter was read each night and what delighted me were the questions and then his own theories which came forth. He became totally engrossed in the book and has requested I find the first two to complete his set.I could ask nothing more from a good, entertaining, and in many ways educational book. The publishers very kindly sent me a copy of this book to review & I’m so glad they did!I haven’t read the other two books in the trilogy, however it’s cleverly written in a way that means new readers can jump straight in to the action of Book three, the conversations etc. recap enough for me to not feel I’m missing out. I’ve no doubt that the other two books are equally as good, and will definitely be seeking them out so I can read them as a whole and expand upon what I’ve already read. I love fantasy books, and this is brilliant as it takes the concept of angels and demons and makes it accessible for a MG & YA audience. 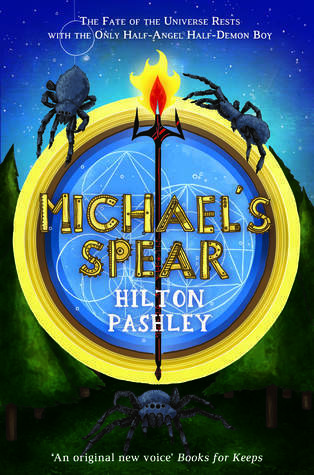 The book is wonderfully written; it’s full of adventure, action, humour and I could imagine this being a very popular choice if it were stocked in the school library or local bookshops.I’d recommend it to fans of Percy Jackson, Derek Landy and Eoin Colfer. Hilton Pashley is a name to look out for!